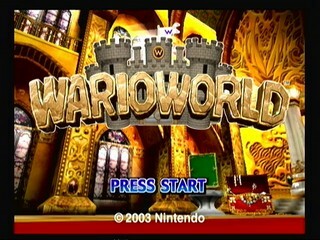 Released in June 2003, Wario World marks Wario's first starring appearance on a home console. The game begins with Wario enjoying his newly built castle, which is filled with treasures he collected from earlier adventures. Of course, as with most videogames, things take a turn for the worst when an evil gem called Black Jewel awakens and takes over the castle, and turns all of Wario's treasure into monsters. The game received fairly positive reviews, but was mainly criticized do to its short length. Best time: Single-segment 0:46:08 by 'Dangerless' on 2014-08-20.